One of the "cooler" gift ideas for the guy, gal, or family on the go. The Koolatron™ Voyager Thermoelectric Cooler uses a 12-volt power outlet from the car or boat to keep the food and drinks cold. There is an optional multi-purpose adapter also available that would allow the cooler to be plugged into a 110-volt outlet. This cooler is great for for tailgating, picnics, and road trips. The Koolatron Voyager Thermoelectric Cooler can accommodate up to forty-eight twelve ounce cans without the use of ice. 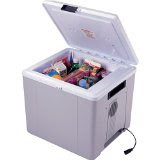 Koolatron Voyager Thermoelectric Cooler - P-27 @ Amazon.com .